The last few reviews that I put up on the blog were about new games that were doing nothing new, but instead something already done. But they were doing it very very well and at the same time implementing something cool that made those games rather unique. Today I'm planning on continuing this trend. 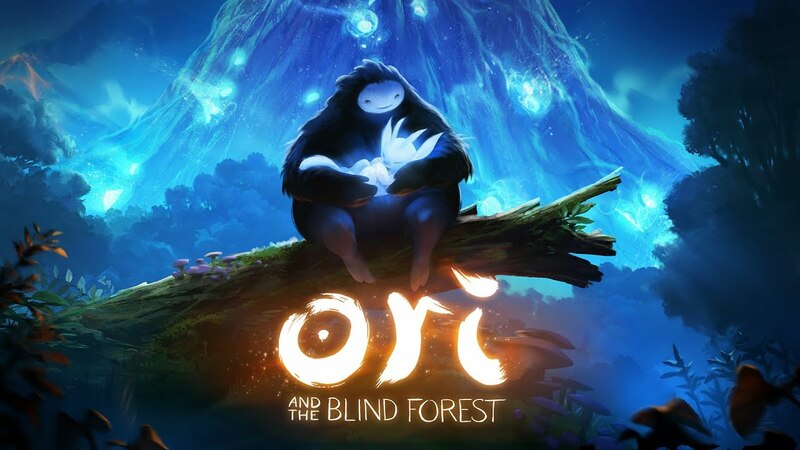 Ori and the Blind Forest is a 2D platformer/Metroidvania game with light RPG elements, developed by Moon Studios and published on 11th of March 2015. During a horrible storm the young Ori fell from the Spirit Tree and is found and adopted by Naru who rise him up as her own. Later on the Forest is struck by a disaster and it starts to slowly die out. Naru is one of victims of this disaster. The newly orphaned forest spirit Ori now has to try to understand and save the Forest he is living in. Ori and The Blind Forest is a 2D platformer adventure game with rather big interconnected World to explore. But as in any Metroidvania game in Ori you will find many doors, seals, barricades and what not that will block your way. To open doors you will need key fragments that sometimes can be challenging to acquire, other times your magic power will need to be at certain level, so returning for those mana upgrades that you passed might be a good idea. Other collectables are revealing map fragments and life upgrades which are always nice to have. While on your adventure you will also collect Spirit Light from interacting with different objects and killing enemies. When enough is collected Ori will level up this allowing him to learn new ability from the three skill trees - Offensive, Exploration and Survival. In the depths of the Forest you will also find Ancestral Trees which will teach you skills that cannot be learned in any other way and are key for progressing trough the game. Ori and the Blind Forest use both Checkpoint saves(Spirit wells) as well as Manual player saving(Soul Links). But while the Chekpoint will save your progress and refill your life and mana, manual ones will restore only part of those two and only if have the necessary skills. Either Spirit well or Soul link is required for you to be learn new skill after leveling up. The Soul links are very important part of the game, not only for leveling up, but also because Spirit wells are very rare sight and death brings you back to your last save, which can be just before that really hard part you just got trough. But what Ori does really well is the platforming. There are ridiculous platform puzzles that you will have to pass. Triple jumps with changing direction in mid-air, teleporting around deadly thorns, blinking above filled with spikes chasm while collecting keys, using enemies projectiles and attacks to open paths and outrunning deadly stream while enemies are coming from all sides are just a few to mention. Other key feature of Ori and The Blind Forest is the gorgeous graphics and great music. In its collorful, lively, beautiful scenes it reminds me of Trine, but even better. While wandering through the Forest you definitely gets the impression of a living world, you're really in a forest full of live and inhabitants. Also the characters and to some degree the world give this Ghibli vibe which is surprisingly appropriate for the game. And the music...I don't really can describe at full. The music is what creates the unique atmosphere that Ori and The Blind Forest has. Every piece from it is at its right place giving you the feeling that you need at this moment. The soundtrack of Ori for me is at the level of Transistor and Journey. And the third part of this already great world is the story. I won't spoil it for you, but it is really touching, meaningful and well told trough flash backs and short cut-scenes. It has its tense moments with Ori hiding and running from Kuro, it has nice plot twists and heart-breaking moments especially near the end. Ori and The Blind Forest is really well made platformer/Metroidvania adventure game that have all the necessary elements for a game from this genre to be good...and then it has some more! For me was impossible to find weak spot in it. Its controls are good, it platforming puzzles are very crafty, various, challenging and deadly. It will take real skill and a lot of patience to pass some of them. The world in which the game is set is amazingly beautiful, varied and alive. While playing the game you will really have the feeling that you're traversing an old great forest full of life. Also the masterpiece music and the well-presented, touching story create amazing, little sad atmosphere that completes the forest world of Ori. I wholeheartedly recommend you Ori and the Blind Forest, try it and you will thank me after that. P.S. It's no brainer I guess, but don't touch it if you don't like/are no good at platformers, because if you do it will be painful experience for you. Публикувано от Sharki в 3:53 ч.